: Invited Competition, September 2010. 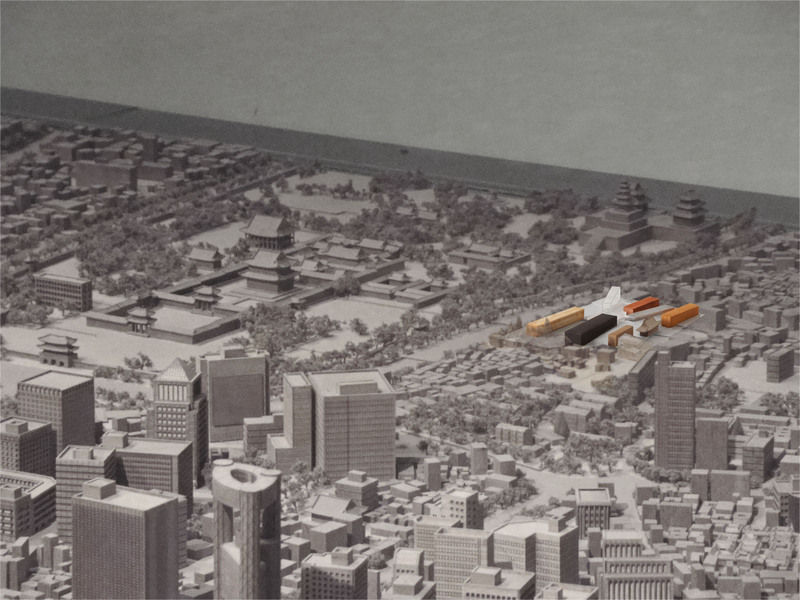 The former Armed Defense Security Command, Kimusa has been an anachronistic symbol of Korea’s colonial and authoritarian past, creating an island of austerity and an urban disjuncture within an increasingly vibrant Bukchon community. In place of a single building or an institution, we propose to create a ‘place’, a node, or an urban juncture allowing for a multiplicity of exhibition, exposition, and participation, accessed and experienced from multiple angles and levels; reconnection of the broken streets and alleyways that will speed the regeneration of the vibrant energy around this area. 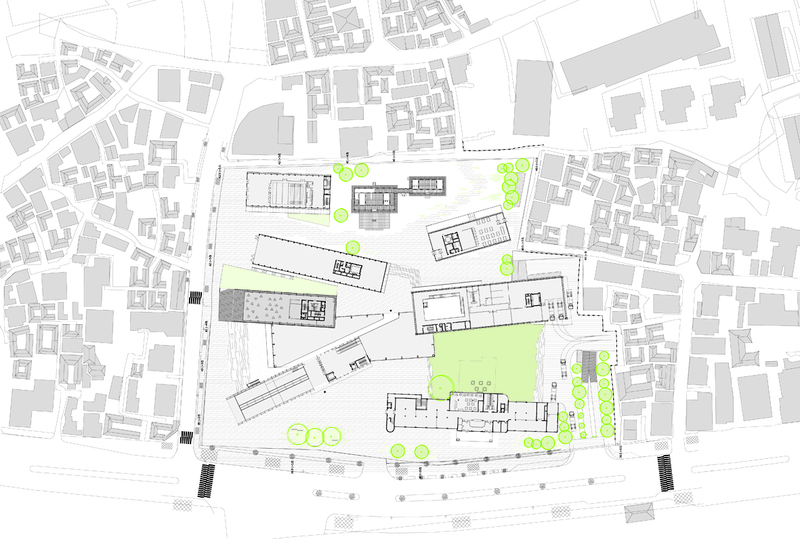 The exhibition spaces of the new museum is proposed as a series of independent buildings that follows the small grains of the context instead of the big rooms inside the big museum complex. The seven buildings that reverberate the shapes of existing Kimusa building are sited framing a series of distinctive outdoor spaces. 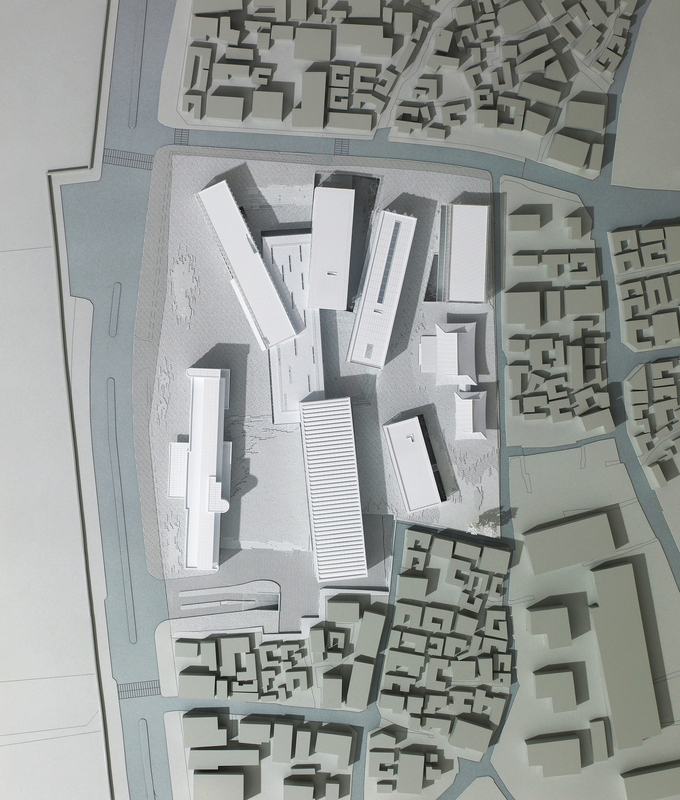 The seemingly random placement of 9 buildings including Kimusa and Jongchinbu will be a symbol of dynamic new museum that sustain layers of history and be recreated as a contemporary urban place. This becomes a platform for creative dialogues and spontaneous communications between artist and public. 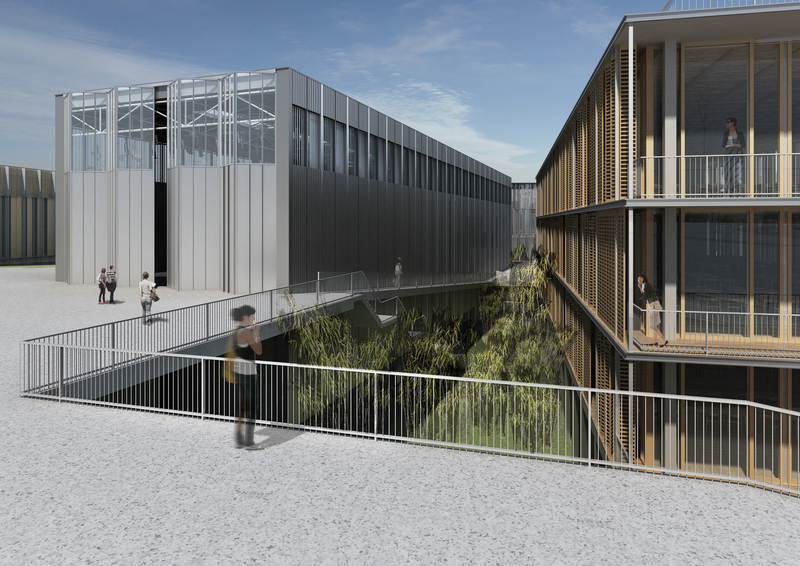 All of the outdoor area can be approached directly from the street level connecting linear movement from the streets near by that could be naturally led to the museum or simply cut across the site. 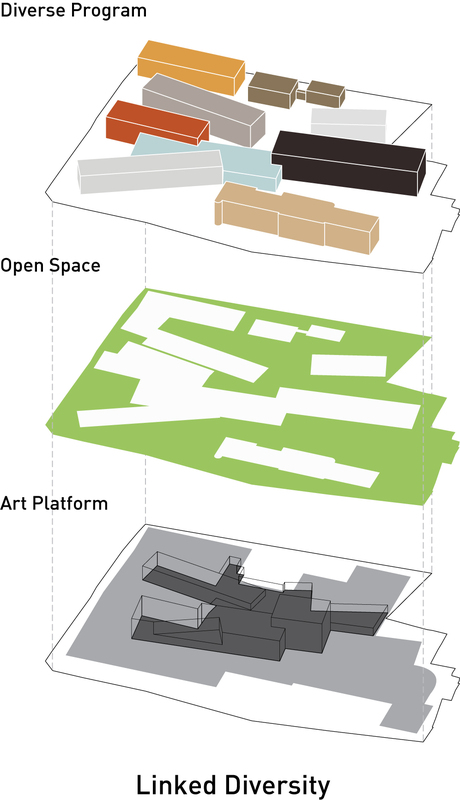 The open space between 9 buildings provide urban lounge area and exterior exhibition space for various public art projects, media art and performance. 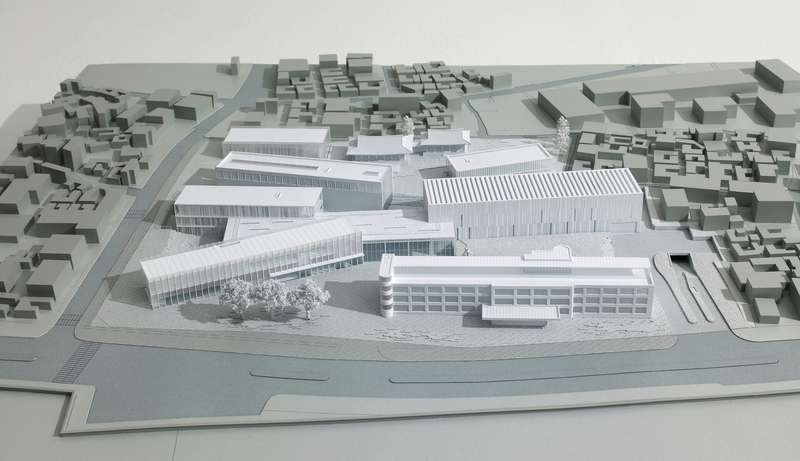 Between the buildings oriented south-north direction, all of the outdoor spaces are exposed to abundant sunlight. The series of exhibition spaces are independent and has distinctive character to adapt to various approaches in contemporary art and provide diverse platforms for every process of creative activities and education. 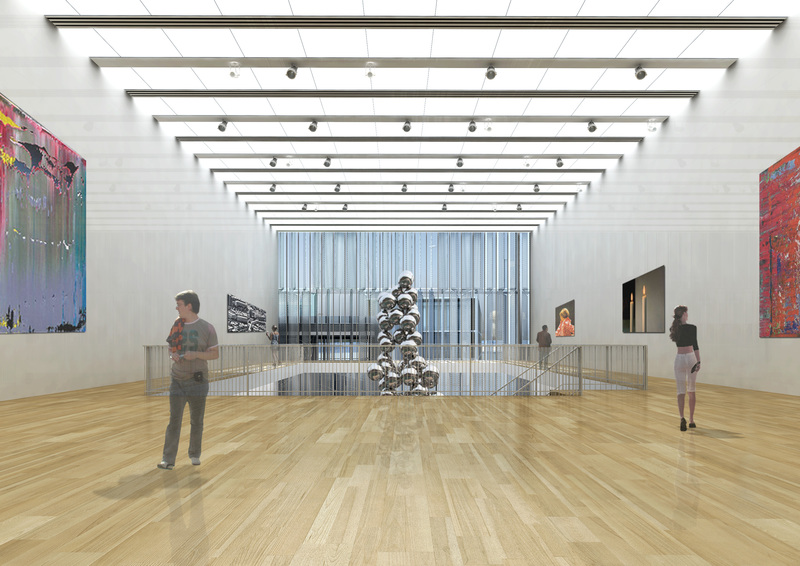 The museum is composed of different exhibition spaces (classic white cube, avant-garde exhibition, installation exhibition, and citizen’s gallery), urban lounge area(café, restaurant, and sky lounge). It provides clear independent route to each selected destination avoiding the dictated routing that can be often found in big museum complex. The main entrance is located in the center of western side and leads to the art platform level below. The art platform is a loose center that allows connection to every building. Then each building has separate access that can be carefully controlled according to the museum’s program or different opening hours. 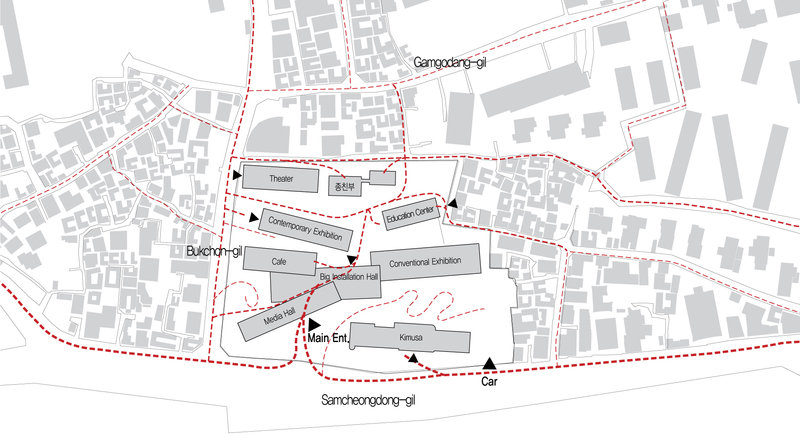 For instance, the Contemporary Exhibition can be approached directly from the Bukchon-gil and Conventional Exhibition from the central courtyard respectively. The Café, the Theater, and Education have clear security zoning for independent operation during museum off-hours. Freely located buildings will not only visualize traditional landscape of the surroundings from SamChungDong road, but also provide interesting sequences to the sites from entrance of the alleys. 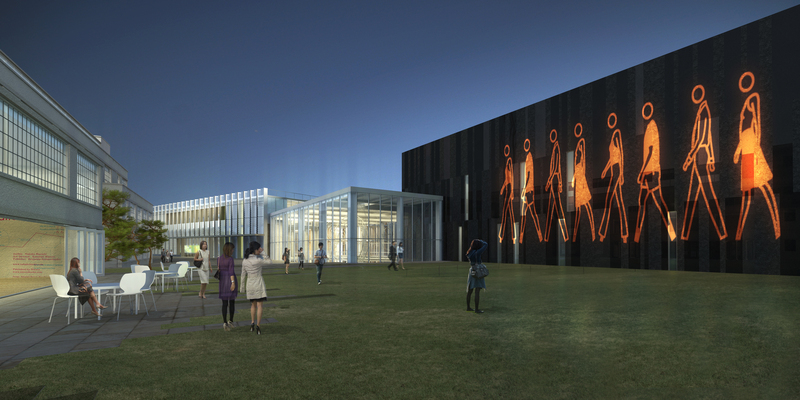 The main entrance endorses free circulation flow into each building through the art platform of the Big Installation Hall. This enables diverse and flexible exhibition. Additionally, individual entrances from various directions allow each building to create independence as an individual gallery. Diverse sizes of the spaces surrounded by distinctive galleries form attractive exterior space like the traditional art work of Korea. These easily accessible and flexibly connected spaces offer fascinating experiences to the public. The Art Platform is the center of exhibition circulation located below ground level directly approached via minimal entrance hall on street level. It is a multi purpose open hall that can be transformed into exhibition space itself. The platform area at the theater and education can be separated from the rest of the museum hall for the independent operation of two functions during museum closing hours and dates. As an urban art museum, MoDo is planned to house more temporary and changing exhibitions rather than permanent collections. 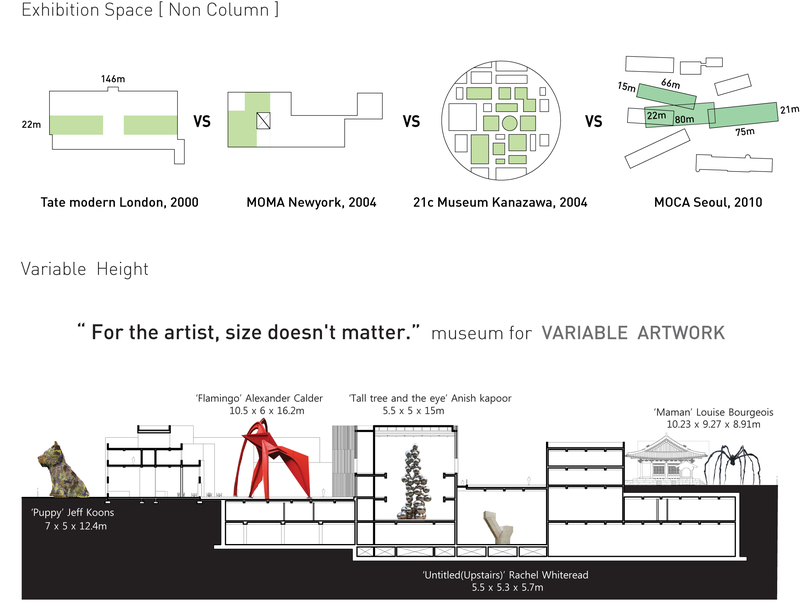 Each building in the new museum is designed to enable diverse exhibitions with distinctive character; various proportions of volume, nature of interior space according to its finish, balance between natural and artificial light, structural components and their usage; all offer a diverse and flexible environment in which to exhibit across a wide spectrum of mediums that encompass contemporary art. Just as important is the consideration of the visitor/viewer. The intention is to give the maximum freedom and choice to the visitor to control the intensity and duration of their encounter. 구 기무사 건물은 한국 군사정권과 권위주의로 대표되는 과거의 상징이었다. 지금도 이 건물은 북촌지역에 유일하게 통과할 수 없는 견고한 요새로 남아 이 지역의 활기찬 흐름을 끊는 단절의 형상으로 자리 잡고 있다. 길을 모은다는 뜻의 모도(募道, Collective Passage)는 새로운 미술관이 여러 각도와 차원에서 접근한 다양한 전시와 참여가 가능한 도시 문화의 중심이 되기를 기대하며, 대지 주변의 단절되었던 크고 작은 골목길들을 연결하여 활기찬 에너지의 흐름을 소통하게 하는 시민들에게 개방된 장소로써 거듭나도록 하는 제안이다. 커다란 대지에 들어설 새 미술관의 각 전시관은 커다란 미술관 내의 커다란 방이 아니라, 옛 도시구조의 아담한 규모를 간직한 주변 컨텍스트와 균형을 이루는 독립적인 건물로 이루어질 것을 제안한다. 대지에 보존될 근대 문화유산인 기존 기무사 건물과 이를 단순한 형태로 본뜬 비슷한 높이와 크기를 가진 일곱 개의 장방형의 건물들이 들어서면서 일련의 외부공간을 형성할 것이다. 언뜻 보기에 우연처럼 보이는 건물들의 배치는 다양한 장르의 예술 활동 간의 창조적인 대화, 예술가들과 시민들 간의 자유로운 교류를 이끌어 내면서 과거의 역사를 보존하되 이를 현대적으로 재해석하는 역동적인 도시 미술관의 상징이 될 것이다. 대지 동쪽에 복원될 종친부 건물은 기존 기무사 건물과 함께 대지가 가진 여러 겹의 역사적 흔적들을 더욱 뚜렷하게 드러낼 것이다. 이들 사이에 모였다 흩어지는 새로운 건물들의 구성은 그 자체가 도시 스케일의 거대한 대지예술 작품으로 읽혀지면서 미술관의 창조적 에너지의 흐름 그리고 과거와 미래가 역동적으로 공존함을 표현할 것이다. 종친부를 포함한 아홉 개 건물들 사이에 형성된 다양한 성격의 외부공간은 모두 도로 레벨에서 직접 진입이 가능하여 주변 길들의 흐름이 매끄럽게 이어질 것이다. 지나가는 시민의 부담 없는 발걸음은 미술관 내를 통과할 수도, 때로는 자연스럽게 전시장 내로 인도 될 수도 있을 것이다. 남향 빛을 필요로 하지 않는 전시동들이 남북 방향으로 배치되어 이들 사이에 형성된 외부공간들은 충분한 자연광에 노출되어 있게 된다. 각기 다른 성격을 가진 외부공간들은 도심 속의 작은 휴게 공간을 제공할 뿐 아니라 공공을 위한 조각 작품이나 미디어 아트, 퍼포먼스 아트 등이 전시될 수 있는 외부 전시공간으로서의 역할을 한다. 새 미술관 건물의 독립적이고 다양한 공간의 구성은 예술 전반에 끊임없이 시도되고 있는 다양한 접근을 수용할 수 있으며, 이에 따른 예술의 창작, 감상, 교육에 이르는 전 과정을 아우르는 독창적인 공간이 될 것이다. 뚜렷한 개성을 가진 다른 성격의 미술관들(전통적인 화이트 큐브, 설치 미술관, 실험 미술관, 시민 갤러리), 도심 휴게공간(카페, 식당, 스카이라운지), 극장 및 교육관 등으로 이루어진 독립적인 개개의 건물들은 흔히 거대한 미술관 콤플렉스가 가지는 미로와 같은 전시동선이 아닌 관람자의 선택에 따른 자유로운 관람동선을 명확하게 가지도록 한다. 미술관의 주진입은 대지 서쪽 중앙의 간단한 진입홀를 통하여 지하공간의 아트 플랫폼으로 인도된다. 아트 플랫폼은 미술관의 중심공간으로서 건물 안의 모든 공간을 연계하면서, 예측 불가능한 현대미술의 요구에 대응하여 융통성 있게 사용될 수 있는 다목적 공간이다. 아트플랫폼으로부터 모든 전시관으로의 직접적이고 쉬운 접근이 가능하지만 미술관의 전시 성격에 따라서 도로레벨에서의 직접적인 진입도 가능하다. 예를 들면 기획전시관동 북촌길로부터, 일반 전시동은 중앙의 중정에서 직접 출입이 가능하다. 카페동과 극장동, 교육동은 명확히 구분된 보안 관리 영역을 가지고 미술관 폐관 시에도 운영될 수 있도록 하였다. 진입 레벨에서 한층 내려오면 모든 전시관을 연결하는 커다란 홀에 이르게 된다. 이 아트 플랫폼은 모든 건물들을 연결하는 역할을 할 뿐만 아니라 그 자체가 전시장이 될 수 있는 개방적인 전시공간이다. 넓은 홀은 부출입구가 위치한 교육동과 극장동 건물과도 연결되고, 뮤지엄 개관시간 외에도 사용될 수 있는 극장동과 교육관이 독립적으로 운영될 수 있도록 두 영역으로 분할이 가능하다. 도시 미술관으로써 모도는 상설전시보다는 기획전시 위주의 운영을 고려하였다. 끊임없이 변화하는 각양각색의 전시 프로그램에 유연하게 대응할 수 있도록 매스, 내부공간의 성격, 재료, 자연광 유입 정도, 기능과 이용 등을 달리 구성하여 계획하였다. 새로운 미술관의 각 건물들은 이질적이고 진화하는 예술의 제작형태와 다양한 표현방법을 수용하기 위하여 성격이 다른 전시 공간들로 계획하였다. 관람자에 대한 배려 또한 중요한 계획의 주안점으로써 작품 감상에 대한 집중이나 감상 시간을 자유롭게 조절할 수 있도록 하였다.